If you’ve ever ridden through a mid-July day in a non-mesh motorcycle jacket, you are certain of 2 things; riding in summer is a lot of fun, and it would be even more so if you weren’t currently leaking sweat out like the waterfalls on the flying islands of Pandora. For women riders who are looking to maximize the former and limit the latter, the Olympia EVE Women’s Jacket is new for 2017. 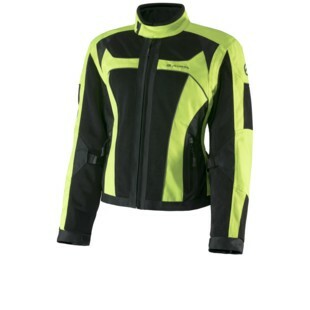 The outer shell of the Olympia Eve Women's Jacket is constructed from a combination of highly durable 600D EVO Thread fabric that is highly resistant to abrasions, and multiple panels of ballistic mesh for maximization of airflow into the torso. Behind the outer shell resides an armor arsenal of CE-approved protectors at the elbows, shoulders, and back. Additional features of the Womens Olympia Eve Jacket include an 8” connection zipper to attach to Olympia jackets, custom fit detailing at the collar, cuffs, elbows, and waist, as well as YKK zippers and an over (or under) rain jacket that can be deployed should the hot sun turn cloudy, rainy mess. In the end, Olympia has done a good job of looking out for riders who seek to trek on come rain or hot-weather shine. The Women’s EVE Jacket is yet another example of the brand looking for what riders need, and working like crazy to bring it to the market.